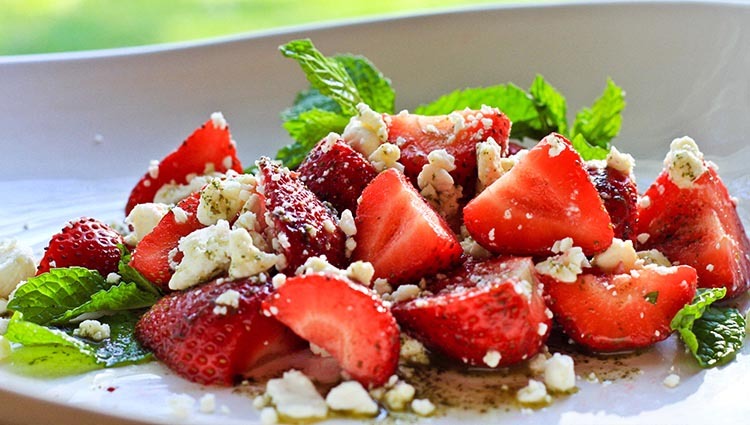 Mix up and share this yummy feta, strawberry and mint salad. Easy to make and a true crowd pleaser. In a blender, combine olive oil and mint. Process until smooth. Combine strawberries and sugar. Toss gently. Recipe can be made up to this point a day in advance. To serve, place strawberries on individual plates. Add Odyssey Crumbled Feta. On each plate of strawberries and cheese, drizzle 2 tbs. of the mint and oil mixture (Mint Drizzle) and ½ tsp balsamic vinegar. Garnish with mint sprigs.